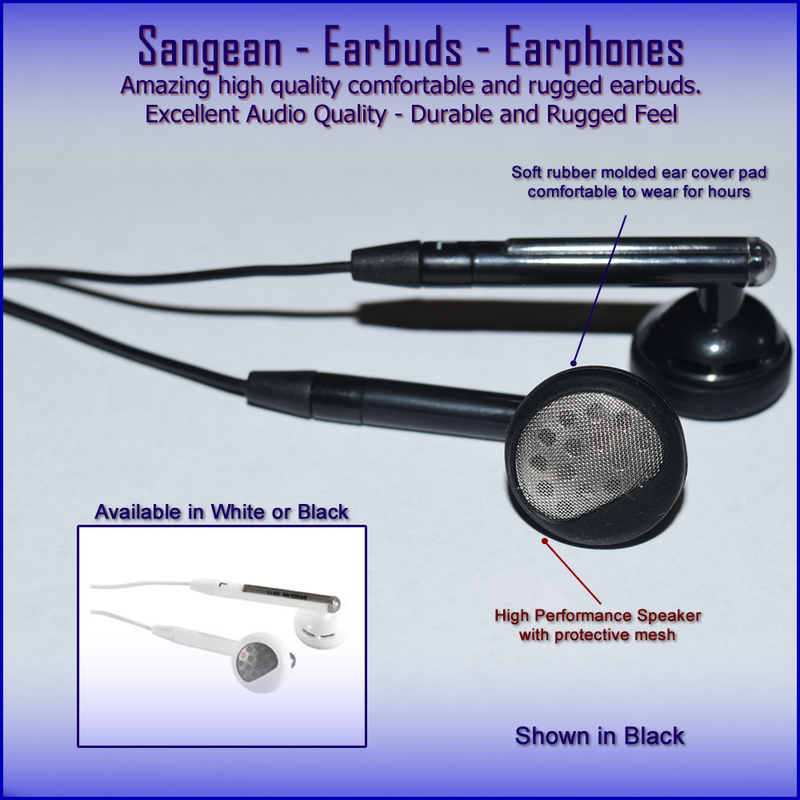 These high quality earbuds from Sangean, are such an amazingly high quality item. These are the new style, modern, full audio earphones from Sangean, found inside of some of their high quality radios. We have compared these stylish, modern earbuds to many other stock earbuds, such as iphone, android and the majority of other radio company’s earbuds, and these are so much better quality than anything else we have tested. If you’re an AM, Shortwave or even podcast listener, or if you frequently find yourself listening to audio at night, you know that a comfortable set of headphones can really make the difference. Poorly designed earbuds fall out of your ear, are hard to lay on if you listen to audio on a pillow and can make you think about the uncomfortable nagging tumor growing out of your head instead of enjoying what you’re listening to. Many earphones fall short or are designed for only listening to while in the vertical position. These earbuds are designed to stay in place in your ear. If you are laying down listening to audio, they don’t feel like a nagging toothache coming out of the side of your head. You can actually listen in full-fidelity and there’s enough tension in your ears that the headphones will not pull out, fall out or shake loose. Standard 1/8″ headphone jack, plugs into most portable radios, ipads, tablets and the majority of audio devices. 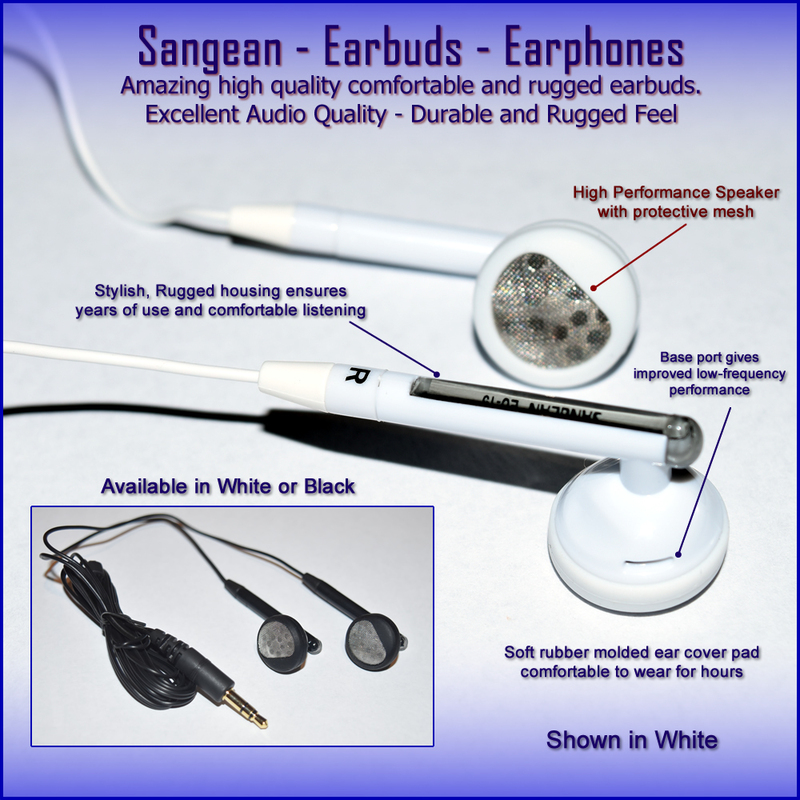 Strain relief cable and 4 foot length, is an excellent choice for most portable audio devices.The Sangean Earbuds Are A High Quality Set of Stereo Earphones with Powerful Bass and Excellent Sound Performance. These High Quality Earbuds Are Great Addition to Any Radio, Sangean or Otherwise. Get A Pair and Experience the Feeling Yourself. Lightweight and Ideal for MP3, Portables, Radio, CD, DVD, PC and Mobile Phones. Available in White and Black.